The statements above are true! “Beginning sometime between May 7 and May 29, local, state and top level federal authorities will respond to simulated weapons of mass destruction attacks in three cities — Denver, Portsmouth, N.H., and the Washington, D.C.-area. Denver or Portsmouth will face either a simulated biological or a chemical weapons attack. The D.C. metropolitan area will respond to a radiological attack drill — which could range from simply an exposed container of radioactive material to a small nuclear detonation. The congressionally mandated exercises are intended to examine how well local, state and federal authorities are prepared to respond to and together deal with the consequences of a weapons of mass destruction attack. “The goal of the exercise is to assess the nation’s crisis consequence management capacity under extraordinarily stressful conditions,” the Department of Justice said in a statement released Thursday. The entire 101st Airborne Division will be assigned to guard the government’s offices for the duration to protect the government from the people ­ and to keep the government officials from leaving their offices—for any reason at any time. Failure to show up for “the drill” will carry a $10,000 dollar a day fine for every member of the government who refuses to participate in this mandatory drill that is not intended to actually injure anyone (unless of course a real nuclear-weapon gets mistakenly used). If someone decides that this simulated nuclear-attack might become another Reichstag Fire which enabled the end of the Democratic government of Germany: Then the Fourth Reich here could imitate The Third Reich then who arose from the ashes in Berlin, to hail Hitler as the new leader of Germany. “Volunteers and professional actors will play the roles of victims, who will be rescued, diagnosed, decontaminated and treated over the 10-day period. A “virtual news network” will be created that will broadcast on the exercises every hour on the hour. But the exercises will not be too realistic, authorities say. No weapons or agents will be released and, to minimize the risk of public panic or real-life accidents, emergency responders will not be speeding with lights and sirens blaring to the scenes of attack. “We’re doing as much as we can by way of outreach through the media to ensure that all of the residents in the jurisdiction or the cities that we’re exercising in know that they’re occurring, knowing that they’re safe from harm,” said Doug Johnson, the Justice Department’s spokesman for the exercises. Congress has provided $3.5 million for the Denver and Portsmouth exercises, which are called “TOPOFF,” reflecting the participation of senior officials. The exercise in the D.C. area, involving district and Prince Georges County, Md., authorities, is called National Capital Region 2000, or NCR-2000 for short. The three exercises are expected to involve all key personnel who would respond to an attack: federal agency personnel and state and local emergency responders, including police, fire and emergency medical personnel. Though terrorism response exercises are conducted routinely across the country, “this marks the first time that an exercise of this scope, with the participation of top-level federal, state and local officials, has ever been conducted,” the Justice Department said. Mayors, city managers, state governors are expected to participate, as are some senior federal officials: Attorney General Janet Reno, Federal Emergency Management Agency Director James Lee Witt, and Health and Human Services Secretary Donna Shalala. 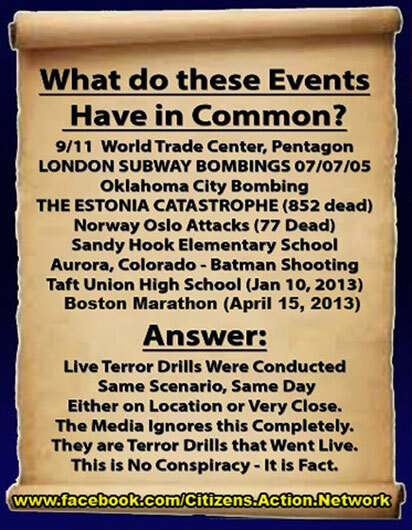 By last Thursday the government was too deep in denial over the current false-flag unraveling in Boston to release anything new. One could have surmised that if the worst had happened, USI would be permanently crippled, and we’d all have a second chance to take our freedom back! “Though many drills come and go without an event, TOPOFF drills have been known to go live in the past. People that have been awake for awhile and have read enough are well aware how real this could get, they’ve been ramping up these drills and ramping them up and its only a matter of time until they take it live, I pray that hour isn’t approaching. I find it troubling how they’ve set the stage for trickery in withholding details to shock the participants, and this sets the stage for a small contingency to sneak around and carry out actual acts of terrorism"
Ironically at first I thought this might be real and was determined to demand that the government RESIGN for this additional outrage (because the facts on the image above are real). How is it possible that any people could ever allow this government that has brought into being so many deadly-attacks upon the public, to remain in office for over twelve years—and not do ANYTHING to end them instead of waiting for them to kill us?